This 3D image represents a StormCap system on a Conventional Roofing Assembly (CRA). For a Protected Membrane Roof (PMR), the root barrier is placed under the insulation. Everything you need in a green roof, and nothing you don't. 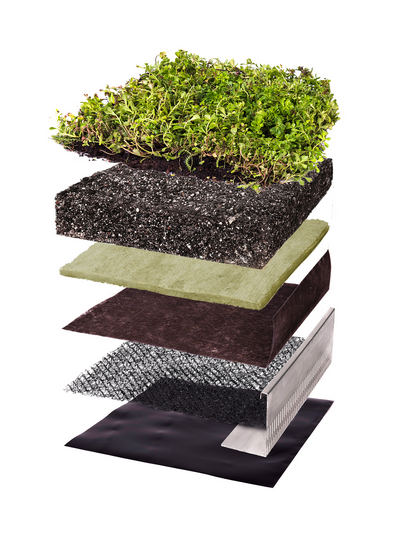 Innovative, easy to install green roof system uses quality pre-grown mats, engineered growing medium and high performing base layers. Enhanced by Urbanscape®’s needled mineral hydro blanket made solely of virgin rock fiber with superior water retention characteristics holding 90% of its volume in water. Boasts a 90 per cent coverage with a broad variety of mature plants species, field-grown for a minimum of 12 months. This full foliage canopy protects soil erosion and prevents lateral water flow. Comes in rolls and easy to install. 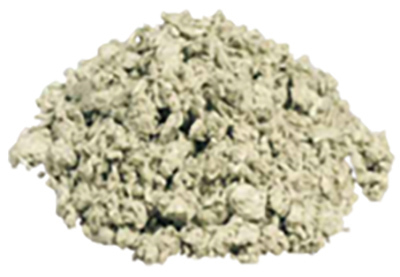 Proprietary, FLL compliant, soil recipe preferred by vegetated roofing plants and especially formulated for rooftop application. It encourages microbial soil health, healthier plants, reduces runoff and eliminate irrigation and the potential need for synthetic fertilizers. 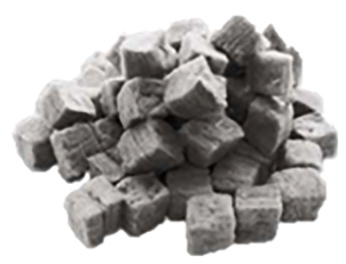 Stormwater retention can be further enhanced by Urbanscape®’s Mineral Hydro Cubes or Hydro Flocks. Innovative and lightweight, the Needled Mineral Hydro Blanket comes in rolls easy to install. An excellent alternative to traditional growing media, the Hydro Blanket instantly absorbs rainwater and ensures superior water retention in green roofs. It is made of long virgin rock mineral fibers specially needled to form a dimensionally stable and retains 90% of its volume in water. The simple rock fibers have high capillary capacity to naturally attract water. Roots love to grow into them. A non-woven geo-textile filter fabric layer which serves as a filter fabric against particle erosion and to prevent obstruction of the drain. Lightweight, durable and flexible nylon matting provides a high drainage capacity. Comes in rolls, easy to install. Flexible, root resistant barrier made of low density polyethylene (LDPE) that is chemically inert and compatible with roofing/ waterproofing membranes. Comes in rolls, easy to install. Modern and durable aluminum inspection chambers, edge treatments, connectors and other optional products to enhance performance and aesthetic.